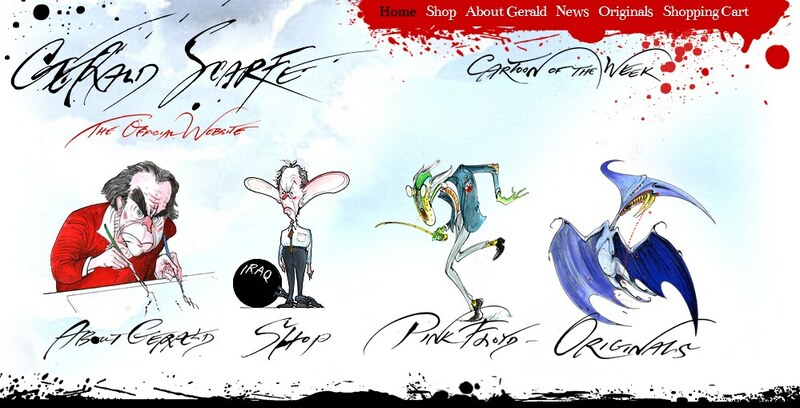 The official Gerald Scarfe website has just had a major overhaul. For a long time, the site has been an interesting destination, with information on Gerald - best known by Pink Floyd fans for his wonderful work on The Wall, but of course he started his association some years earlier providing a wonderful caricature of the band for the 1974 tour programme (comic). The new website retains the biographical detail on Gerald's life and career, and news of recent and upcoming events and appearances, but has a dramatically expanded retail area. This part is worth a visit alone - the Pink Floyd section now includes a number of images which have not been revealed before, and these are available to purchase as high quality, signed limited editions direct from Gerald. So, not cheap, but should look stunning on your walls, and the range of images are fascinating to browse through, too. His other work (principally political material) is also well worth spending some time studying. The website can be found at (unsurprisingly) www.GeraldScarfe.com.